Why bad weather at the Feast of Tabernacles? Is there a reason for the heavy rains, snow, hurricanes? Doesn't God AUTOMATICALLY give us good weather for His Feasts — especially the Feast of Tabernacles? AT FIRST glance you might think this a strange title for The GOOD NEWS. After all, we are the "peculiar people" of this earth who really do believe in God and know that He IS all powerful — or do we? We certainly are "peculiar!" No one would argue that point. Just a few months ago, eleven to be exact, I heard these very words on Jekyll Island. The Feast was over and all had gone except a handful of men who remained as the cleanup crew. I had stayed behind to see that the tent was down, that all equipment was returned or stored and for the purpose of paying our bills. In one of the gift shops across from the Aquarama, the shopkeeper was busy taking inventory. The woman clerk speaking to the manager was overheard to say, "They are a peculiar people. They didn't buy one single pillbox!! You won't believe this — but one of them told me that they didn't even believe in taking aspirins!" It is for sure, we are peculiar! We are the people who believe in honesty at all cost, in setting the right example, in keeping the Sabbath. We believe in a Living God, and a dynamic God that sees and hears all — at least that is what I thought we believed in — now I am not so sure!! 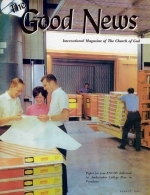 Remember the hurricane of 1964 that preceded the Feast of Tabernacles? That terrible storm just about made it impossible to hold the Feast at Jekyll Island. Its rains carried right over into the Feast itself. But God miraculously reversed the hurricane — and punished Cuba with it. Those of you who attended Jekyll Island last year will remember the violent rainstorm that began forming out over the Atlantic. As we watched the storm approach, it suddenly took a direct course straight for Jekyll Island! It hit the northern section of the Island with such force and impact that we wondered if our huge tent would survive another ten minutes. Some of our northernmost campers were practically flooded out of their camps! Mr. Armstrong was forced to cancel an afternoon service and, of all things, it repeated itself during the evening. It actually rained out one family three different times, drenching their bed clothes and other belongings! We have had other rain, snow and wind storms at just about every Feast site around the world. I well remember the terrible winds that struck just before and during the Feast of Tabernacles in Squaw Valley, California, two years ago. Our giant canvas backdrop was ripped to shreds! Have you ever wondered why we have had such storms, so much weather trouble at the Feast of Tabernacles? Especially so when God says He "createth the wind, and declareth unto man what is his thought..." (Amos 4:13)! We who are the "peculiar chosen people" of God need to examine our Feast conduct! We need to understand the power of God and His concern for His Feast of Tabernacles and His peculiar people! These worldwide storms during the Feast of Tabernacles caused me, out of curiosity, to do a little checking. I wanted to know if there was a reason why we were not receiving eight days of blessings during the Feast of Tabernacles. What I found will shock and amaze you! Jekyll Island will be the principal example, since it is representative of all God's Feasts. Even though we had over 7,000 people registered for the Feast of Tabernacles in Jekyll Island, the highest attendance count for any one service was only 6,326. Our attendance actually dropped below 6,000 on two different occasions during the Feast. Two hundred and twenty-three went to the restroom. Eighty-two mothers and children went to the mothers' room. Three hundred and twenty-four people were counted just milling about outside the tent or in the parking lot! Is it any wonder that we had a rainstorm? That's not all — there is more! From some of the deacons' and ministers' reports we received the following: one day during the Feast, during the services, thirty some people went fishing! Others were observed sleeping in camp and in their rooms. Our Security Patrol found an adult couple sound asleep in their car in our parking lot during the services. Another elderly couple was seen shopping across the street from our huge tent during services! I personally talked to one young man who was sitting in the shopping area across from the tent, with his Bible and notebook supposedly listening to the service over the loudspeakers. He was sitting outside the washateria doing his laundry! The young man first tried to dodge behind cars so that I would not see him. Where does he think God is? Is God all powerful? Is God alive to this young man? Another car with three church members in bathing suits were seen leaving a motel just prior to afternoon services. Others had been observed sunning themselves by the pool at their motel while you were attending services. Another family spent a good deal of time in their motel room — when their children were questioned they said, "Mom goes to morning services and Dad goes to the afternoon services. We just play around." No one was sick, services just weren't that important. Another family missed services because they were corrected for bringing their dog to the Island. They disagreed with Mr. Armstrong's admonition to leave all dogs at home. One of our deacons overheard one of our members say through a motel bathroom wall, "To hell with you, I need half an hour in the bathroom." Another example of disinterest and Laodiceanism was a young man sitting beside one of our deacons during a sermon. The man squirmed relentlessly in his seat crossing first one leg, then the other, smacking loudly on a piece of gum, looking at his watch time after time, letting out great sighs and, in short, displaying a disgusting attitude of impatience. Makes you wonder why he came! We have examples of people who actually wrote in for more than one reservation for the Jekyll Island housing. They received their confirmations, then selected the one that suited them best. One woman wrote in this year asking for accommodations. "We have received official permission to attend the Jekyll Island Feast. If "Standard" accommodations are not available on the Island, our second choice is "Deluxe" on the Island, third is economy. If accommodations are not available on the Island please refund. F.B." In reviewing some of the housing forms this year I was particularly impressed with the number of able-bodied persons who wrote in to our new Housing Office in Jekyll Island and said that they were physically handicapped. Take one from the New York area. We just happened to know this man personally. He is hale and hearty — in fact, he is a good athlete. On his form requesting housing he lists a series of problems such as asthma, hay fever, and getting tired, as difficulties with his health, and requests housing on the first floor, mast definitely on the Island! It makes you wonder — does this man believe that God is all powerful? Or does he believe with the other people of this world that God is dead? There are many other problems. Some of our people are still writing in to make their own reservations! It is not difficult to see that most of the problems revolve around selfishness and the fact that many of our "peculiar people" expect better service at the Feast than they have at home! The few that cause the problems evidently look upon God as an old, senile, physical human being who is riot capable of performing His job. Such concepts can bring down the wrath of God upon all of us! I don't want any of you to get the impression that all is bad! Rather I want all of you to see what actually goes on behind the scenes and let each one of you think about THE PROBLEMS WITH THE WEATHER!! Let me emphasize that we have many wonderful "peculiar people" in God's Church. Attitudes as a whole, have been tremendously good! Take the example of the lady who wrote in after we returned her two checks refunding her the cost of the tent that she purchased for the 1965 Feast of Tabernacles and an additional discount on a tent that had one door instead of two! Although I know that God pours out His blessings on us in unexpected ways, I feel that I should return both of these checks to Pasadena where they will be put to use in His Work. I know that I am getting full value in a tent fly which is waiting for me in Big Sandy. I was excited about the prospect of having a second double door in the tent, but now that I have used it, I think that with two occupants the second door space can be used better for other purposes. The careful and friendly manner in which Headquarters always looks after my interests is sincerely appreciated. I am happy to forward these checks for God's use. Many times the ministry has told us from the pulpit, from the first year at Squaw Valley of the problems that we were bringing on ourselves and the headaches which resulted from a lack of wisdom and rebellion. I have heard many of the complaints and grumblings myself each year, but this year was different. Only two gripes were aired within my hearing. One, the unconverted — the other from an elderly lady who seemed to be having her patience tried a bit! Or the crippled woman who wrote in asking for a room close in, if possible. However, she added that if this were not possible she would understand. She just wanted to be at the Feast, she didn't care how far she had to drive each day so long as she got to attend the Feast. Yes, our people do, for the most part, obey the Eternal God. Obedience does pay off in huge dividends! Yet those of us who work with all four Feast areas have noticed a pattern of problems at the Feast of Tabernacles. The first few formative years, when we begin a new Feast site, there are all types of infractions of Church Government. There is a general lack of good common sense in some cases which leads to troublesome problems. Then as our people mature and put into practice what they hear from the pulpit at the Feast and at their local congregations the problems and the difficulties of past years, even from the weather, improve or disappear. We have other letters — special letters from high officials in government praising your good conduct. There are letters from realtors, businessmen, a governor, Chambers of Commerce, newspapers and the Department of Highway Patrol. They all welcome us and comment on our organization and on our obedience to law and order! Compare our welcome from these individuals with the following statements from one of the residents of Jekyll Island. I have lived here for twelve years and the Radio Church of God people are the finest people I have ever seen. I am amazed that all of your people seem to leave the area very happy and satisfied. This is a resort area, we are used to gripes and complaints from the general run of tourists and convention groups. Your group is such a contrast, I am amazed! These are some of the good examples. There are hundreds more like them! There are also other examples of bad attitudes and disobedience, especially in our newer Feast site, Jekyll Island! Let's go back to the poor fellow who, with his whole family, got rained out during the rainstorm in Jekyll Island. His was the only family that I recall that had any real problem as a result of the rainstorm! Some of the rest got a little wet, but they quickly recovered and had their camp back to normal in a short time. The poor fellow with the "real problems" spent his time, when it wasn't raining, complaining! Something was wrong with his tent, it was an inferior quality, the rain was too wet! Patiently, the camp directors and fellow campers assisted this man and his family to become comfortable. The camp director explained that with any sudden downpours of this magnitude the tent needs additional protection. Even the big commercial tent that we rent for Jekyll Island leaked in that rain. They told him that he needed to "ditch" his tent so that the water would run off away from the tent, not in the tent. He was also told that his tent should have a piece of 10 x 17 plastic over the top, then the tent would shed water like a dock during these abnormally heavy downpours! As a matter of fact, the camp director even offered to drive him over to Brunswick to purchase this inexpensive plastic. But — he was too busy complaining! He didn't need the plastic and didn't want to bother to "ditch" the tent. Soon another storm blew up. There was a repetition of the first. He and his family got drenched for the second time! Loving brethren took them in again and dried off the little kiddies. Again there was peace and calm and then, of all things, it happened the third time! That was the last straw! He demanded to talk to the head of "this outfit — this tent is worthless." He got as far as me — still complaining! I gave him his money back!! It was hopeless to try to help him. He wasn't about to understand or come through with "Works!" It makes you wonder how far behind in Bible study and prayer this individual was — or whether he had borrowed from his second tithe! Perhaps this man thought that some miracle would happen if he just came to the Feast, bad attitude and all, and "exposed" himself to the "Word"! When a young single man with a room containing two double beds befriended our "camper," he wanted to know "How come you got the room and I had to camp?" Is it any wonder that our camper had problems!! These are only a few of the incidents that occurred at the Feasts in Jekyll Island, Big Sandy and Squaw Valley. There are many other incidents of similar nature that occurred at Blackheath, Hayling Island, Fort-de-France, Merrimac, Scottsborough and soon Long Beach. All are God's Feast sites. All function relatively the same with the same pattern of problems mixed with the good attitudes of the majority. Some of our biggest problems are the result of unconverted relatives who attend the Feast. Remember, brethren, the Feast of Tabernacles is a place where God's people gather together to keep the Feast as one body, picturing the time when, after the time Jesus Christ returns to this earth, His Kingdom will begin. The Feast is the time and place where all of us who are of like mind gather to the place where God has chosen to place His Name, and to worship our Creator apart or separate from the world. Realizing this, none of us SHOULD URGE UNCONVERTED RELATIVES TO ATTEND. Many have thought to coerce unconverted mates or relatives to attend the Feast of Tabernacles in hopes that the Feast of Tabernacles itself would convert them. THISIS A MISTAKE! Brethren, many of our problems have been occasioned by the presence of unconverted people at the Feast of Tabernacles who do not understand God's way, and who have given a wrong impression to the public. In many cases, bringing unconverted people to the Feast of Tabernacles can be a stumbling block to them and actually postpone or prevent entirely their conversion at this time. If you have unconverted mates or children who sincerely desire to attend, then I am sure they will be welcome. However, you should be sure they are not hostile toward the truth and toward God's Church. You should be sure that they have a sufficient understanding so as not to stumble at some of the strong meat they may receive during these days. By all means, brethren, IF YOU HAVE ANTAGONISTIC FRIENDS OR RELATIVES — THEY SHOULD NOT ATTEND THE FEAST OF TABERNACULNEDSER ANY CIRCUMSTANCES! I am sure you will understand why this must be done. I also know you will all endeavor to cooperate in every way in this respect. The Feast of Tabernacles is for God's people! Converted people! People that are really "peculiar" — peculiar people that believe and have proved that God is all powerful, that He is a living, dynamic God who does bless or curse according to our "Works" and obedience! The Feast of Tabernacles is specifically designated and designed for peculiar people that don't complain. Peculiar people who are honest and sincere, who make mistakes but are glad to have them immediately corrected. They are peculiar people who repent to God on their knees in the privacy of their closet, booth, or tent and acknowledge the great omnipotent Creator Cod that watches over the ten worldwide Feast sites with a "jealous" eye! God is a God that is all powerful. He is most assuredly alive! You can't hide from God (Amos 9:1-3). He is a God that loves to give blessings and rewards (Deut. 5:29)! Yes, and even good weather. The whole earth is God's. He sends both the sun and the rain. He is slow to anger and great in power. He has His way in the whirlwind and in the storm,.. (Nahum 1:3). We are a peculiar treasure to God (Ex. 19:5). If we were to obey we could expert good weather, perhaps a gentle rain or two during the Feast. Israel Rained Out Three Thousand Years Ago! Several thousand years ago in Samuel's time the people of God sinned. Samuel said, "I will call unto the Lord, and He hall mid thunder and rain; that ye may perceive and see that your wickedness is great" — The Lord sent thunder and rain that day — "and all the people greatly feared the Lord and Samuel" (I Samuel 12:17-18). Jesus Christ is our High Priest today. Maybe we didn't pray for the rain ourselves. Most of us were praying for good weather. Then, is it possible that our High Priest sent the rain to show us cur sins?? You have seen by example that we do have sins — sins that need to be repented of! This is true all around the world, not just at Jekyll Island and not just at the Feast of Tabernacles! But every day of our lives! The real purpose of this article is to point out our problems — so we can repent and "Be [become) ye therefore perfect" — (Mat. 5:48). God will give us what we need to show us our sins so we can become perfect. Now that you have the inside picture — the behind-the-scenes story — let's work harder than ever to be better Christians. Let's put this knowledge to work and have a happier, more wonderful Feast of Tabernacles this year than ever before! The problems that you have just reviewed should help you to appreciate the Godly qualities of our Father in Heaven a little more and cause you to strive more diligently to be perfect like Him! God is alive, God is all powerful — He will bless the 1966 Feast of Tabernacles — if we ask Him and if we obey Him! Let's all strive diligently, as one body, to give of our time, our good attitudes and show loving kindness toward all. Let's try to outdo each other in the good qualities.' Let's forget the getting, and GIVE! We'll see you at the Feast in just a few more weeks!